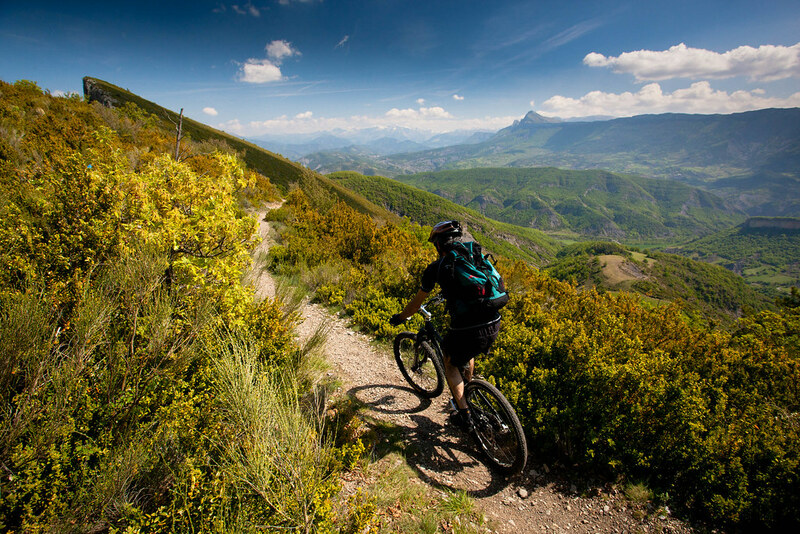 The varied terrain across France means you can enjoy a lot of different mountain biking experiences. Its rolling hills and towering peaks are magnets for mountain bikers of all kinds. From gentle rides through the countryside to multi-day bike packing adventures, France has something for you. Northern France is not known for being a mountain biking hot spot, but if you like going for a pedal through the countryside, you should pay it a visit. There are many ports all along the north coast of France, so it is easy to access from the UK and Paris isn’t too far away either. Just south of the port of Caen is the Suisse Normande route. This 65km ride follows the banks of the river Orne as it cuts through rolling countryside and woodland. You will have panoramic views of the Rochers des Parcs, an area of stunning rocky escarpments, popular with rock climbers. About 60km south of Dieppe is Roumare. A forested plateau just outside the historical town of Rouen on the river Seine. Many rides start from the town hall in Canteleu, which doubles as the town’s mountain bike centre. The easiest trail winds through the forest, past ancient druidic stones and a chateau and is about 14km long. Because of its woodland setting, you may come across deer, red squirrels and other wildlife on the easy flat trails. The Balcon Sur La Seine itinerary is a 20km route that takes you deeper into the Roumare forest and along the river Seine. 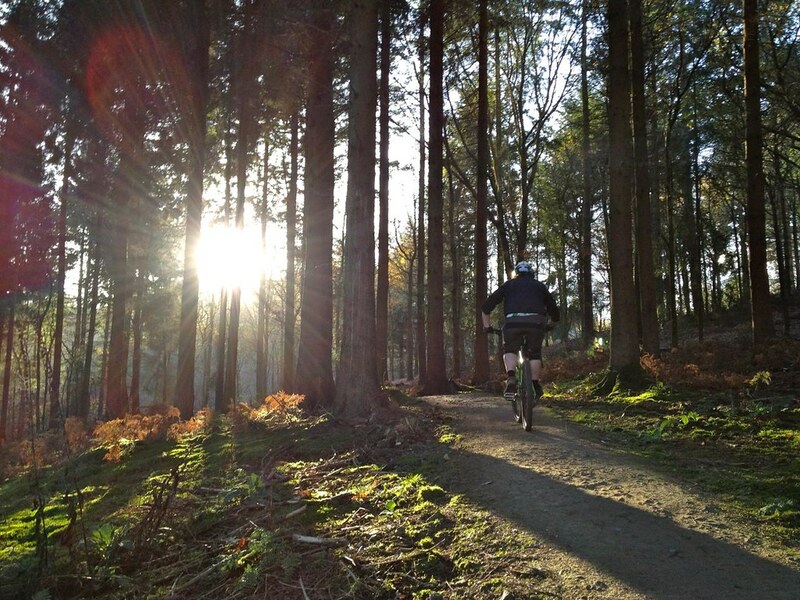 The area around Rouen has lots of mountain bike centres to choose from with varied terrain. Due to its locality to the surrounding towns and villages, there are many nearby places to stay. Hotels, B&Bs and campsites are very easy to find. The areas around Paris are not known for their huge hills and mountains, however, you can find some great forests to explore. Just 20km north of the city centre is the Saint Germain en Laye forest. As with many of the forests around the capital city, don’t expect to need full suspension bikes here, because the trails are very flat and smooth. For something a bit more interesting you may want to head to the Foret de Montmorency. This forest has lots of dirt roads and single track for the intermediate rider. 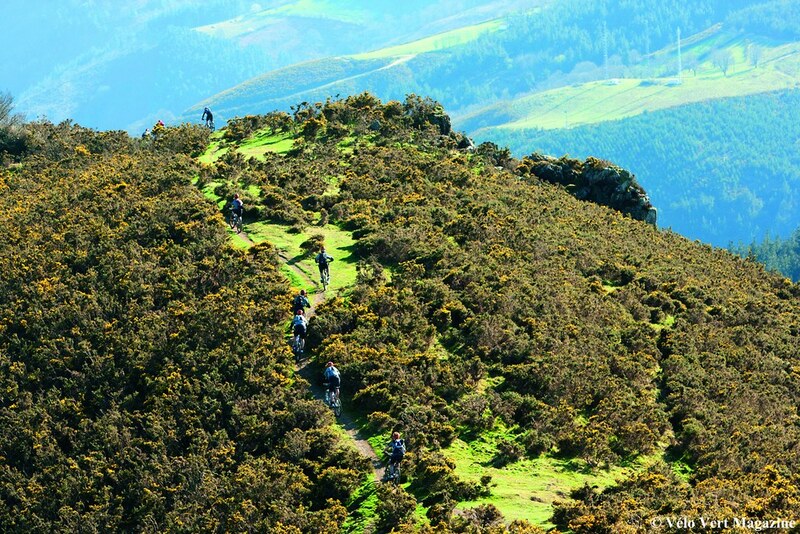 The trail network is very well maintained and is popular with mountain bikers, hikers and trail runners from Paris. Because there are lots of dirt tracks here, it can get very muddy after it has rained. Therefore on soggy days, you may want to head to Fontainebleau. Fontainebleau is a stunning historic city just over an hour drive south-east of Paris. It is also very accessible by France’s excellent rail system. Here you can expect rocky and rooty forest tracks to keep you entertained. A good example you may want to try is La Tournée des Gorges. This 2-hour ride takes you past the main sites on the west side of the forest, namely the Franchard, Houx and Apremont gorges. It starts off as a very easy pleasant trail and gets more technical as you go round, especially on the last descent into Franchard. Limousin is pretty much in the centre of France and has 2 national parks, Périgord Limousin and Millevaches Limousin. The area provides you with beautiful scenery as you explore its forests and mountains. 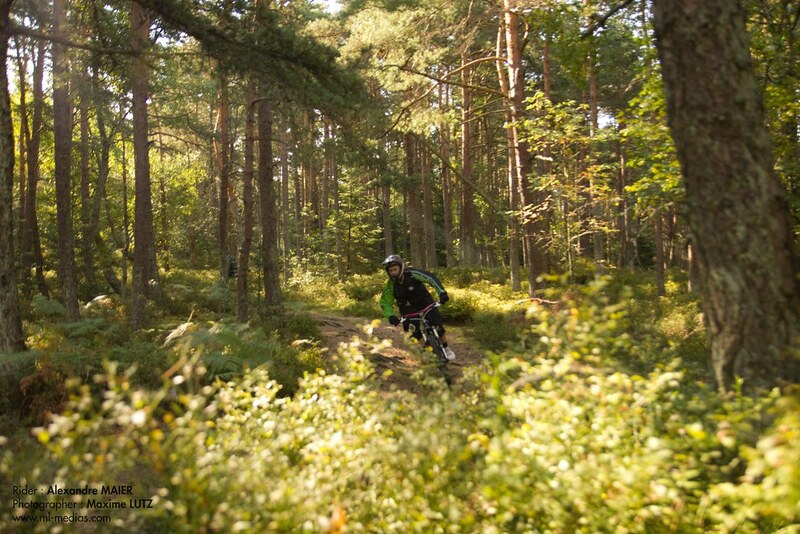 There are 3 official mountain bike centres with graded trails. At the centre Le Lac de la Foret you have 17 marked trails to choose from. Most of the trails are not particularly technical, but you can still have plenty of fun on the miles of track meandering through forests, fields and meadows. You can expect to be riding through lush countryside with a few long relatively steep downhills. However, you will be able to find more challenging rides around Lac du Saint Pardoux, where you will encounter some fun technical sections. If you want to experience mountainous terrain, head to the Centre Escapade Au Pays des Monts de Blond and the Centre Zig-Zag en Haute-Correze for a real challenge. There isn’t a great deal of mountain biking on the western coast of France, it’s better for road cycling, mountain bikers should head south-west to the Pyrenees. The Pyrenees is the mountain range that makes up the border between France and Spain (with Andorra in between). The trails are steep with slow speed technical parts interspersed with fast flowing sections. The type of terrain here is very varied but natural, you will come across alpine style trails, rock gardens, hairpin bends and forests. The natural theme continues when you realise there is not much infrastructure for mountain bikes. Meaning you won’t see many other riders, giving you a greater feeling of adventure and exploration. Because of this isolation, you should carry emergency bike parts and tools, as you will not find a bike shop to help you. Cauterets is a picturesque mountain resort in the Pyrenees. Its bike park lends itself more to downhill riders, but there are some great cross country tracks too. You can join 5 marked trails straight out of the town, one of which is the 10.5km La Reine Hortense route. Its climb will take you to 1120m above sea level, to the superb views over Cauterets and the Pic du Midi, a 2877m high peak with an observatory at its summit. The Vosges Mountains straddle the Lorraine and Alsace regions of the northeast of France. They are near the borders of Luxembourg, Germany and Switzerland. You will find rolling hills, valleys, pine forests and lakes on the Lorraine side and steeper terrain on the Alsatian side. The best time to mountain bike in this area is from late April to mid-October when the temperatures are more favourable. The trails in the forests are stony and rooty, but you will find single track following the mountain slopes and rivers. You can take the Julien Absalon loop around the village of Raon-aux-Bois. 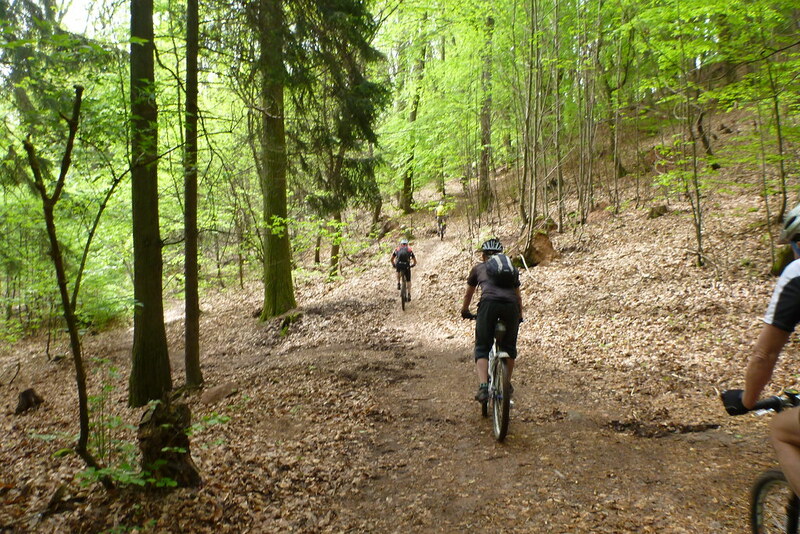 This hilly ride is a 28km long, where you can expect leafy single track through forests. There is nothing technical here, but you will experience a 700m change in altitude during your ride, so expect to do some climbing. Pollionnay near Lyon is home to the Tour de Salvagny. A 42km ride giving you views of Lyon, the Rhone Valley and the Alps. This route is mainly made up of double and single track through forests and over hilltops. You will come across some fun technical sections all the way around. 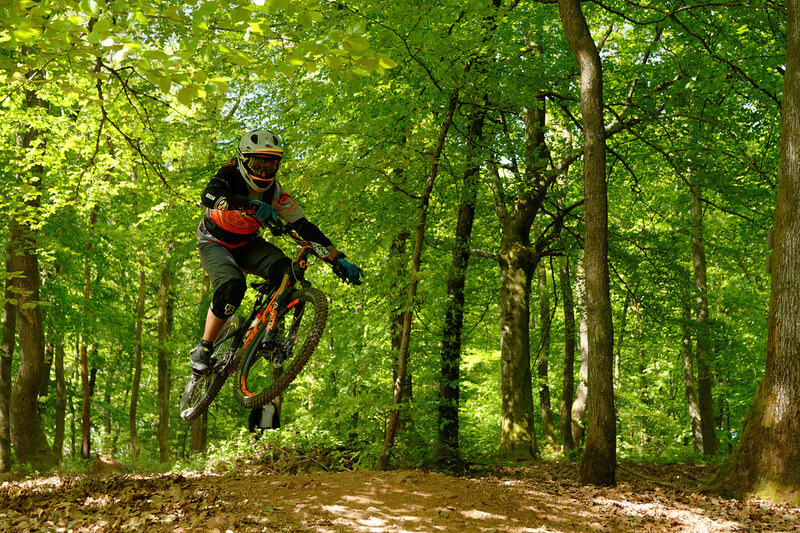 Dry, dusty trails and easy transport links make southern France great for mountain biking. The terrain across the region is very varied. You will find single track, rocky paths, forests, and mountain trails (some overlooking the Mediterranean Sea). It is suitable for all abilities, as itineraries range from gentle rides for beginners to full on downhill bike parks. The climate and geography make it one of those places you can ride all year round too. 95km north of Nice is Auron-Saint Etienne de Tinée. This area is excellent for cross-country, enduro and downhill mountain biking. The trails are open from early June to early September and are mainly aimed at intermediate riders. Although the trails are mainly blue, there are some red and black trails for the more experienced rider. The 15km Circuit de Demandolx is a cross-country route allowing you to take in fantastic views and waterfalls. This is not a very technical ride, but parts of it have some exposure as it skirts around a cliff edge. The Pays Diois in the Drome Provençal is one of the best locations for enduro and cross country riding in the south of France. It is a “back to nature” kind of experience, as you are in the middle of nowhere and there is no bike park. However, it does have 29 cross-country routes of varying difficulty, from green to black. The blue circuits are roughly 15km long, but if you are feeling adventurous there are some epic rides. The Valdrôme is the starting point of a fantastic 2-day circuit. Staying overnight in the Gîte d’etapes Le Pilon in Val-Maravel. This ride is 83km long with 5000m of vertical drop. The terrain is technical cross country style, but never too difficult. You will find that the surface is sometimes smooth, but mainly rocky. There are not many rock gardens to encounter, but there are quite a few switchbacks to negotiate. You can start the circuit of the Galbe from the ski resort of Formigueres. From here you climb over the Sierra de Mauri, before a descent to a mountain refuge with incredible views. Then another climb takes you to the Estany de Diable (the devil’s lake). You will then be treated to a 1100m descent of excellent single track back to the bottom of the valley. The view of Lac Montriond from the Col de Bassachaux, Chatel. Photo by Tom Fortune. The French Alps are home to sensational enduro, cross-country and downhill trails. Many are accessible from the ski lift system. The Portes du Soleil straddles the French-Swiss border and has thousands of kilometres of mountain bike trails. Because the area is so large you can expect the full spectrum of surfaces to ride on. These trails have it all, rocks, gravel, roots, leaves, clay and dirt. Morzine is 80km from Geneva and offers easy access to the whole Portes du Soleil. There are lots of downhill runs from the Pleney telecabine that link up to the neighbouring resort of Les Gets. But the Super Morzine bubble lift has the easier green runs and takes you to the links to Chatel and the Swiss resorts. There are a lot of enduro rides you can choose from too. There is 2 to 3-hour ride known locally as the ‘chapel run’ that starts in neighbouring Les Gets. The trails on this route are mainly made up of undulating fire road, and loamy paths through forests. The forest opens up every now and then to reveal isolated log cabins and great views of Mont Blanc. The Haute Route is an epic ride from Chamonix to Zermatt in Switzerland. Originally made by alpinists, but there is a route adapted for mountain bikes. You start in the shadow of Mont Blanc and reach the unmistakable view of the Matterhorn. This is a technical ride on alpine trails at high altitude with amazing scenery. It will take you 8 days to complete, based on 4 to 6 hours of riding per day. Therefore you will need to be super fit, be prepared to take on big climbs and carry your bike. The downhill sections can be very technical, but the views are incredible. This is one where you will need to book a guide. They will be able to transport all your belongings to the finish point and organise accommodation along the way. When mountain biking in the southern French Alps you will find a huge amount of varied terrain. This area has easy trails through fields of lavender to high altitude technical single track. Les Deux Alpes is an hour and a quarter drive from Grenoble and has a great mix of enduro and downhill trails. The Jandri Enduro trail has the highest start point of all the trails in the valley. You will be treated to spectacular views, as the ski lift brings you to the bottom of the glacier. You start well above the tree line, meaning the surface is made up of gravel and rocks. This trail is 4.5km long and takes you to the mid station of the Jandri Express lift. You then have the option of going back up or continuing all the way to the valley floor. The Pied Moutet side of the valley is best for beginner downhill riders as there are some nice green trails to start on. There are some mellow blue runs on the other side of the valley from La Fee. But the one from the Jandri Express ski lift is very long and technical. Alpes D’Huez is less than an hour drive from Les Deux Alpes. 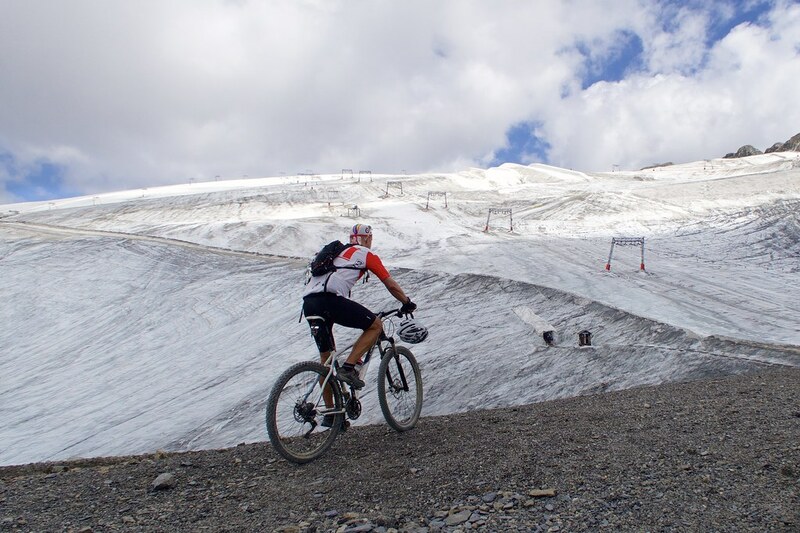 It has a great mix of flowing singletrack cutting through forests, moorland and of course the glacier. The trails here are natural and technical, giving you that “big mountain” feel. There are lots of cross-country routes starting on the valley floor too. One of which is the Serenne ride, a short and easy loop ideal for beginners and families. It has a gradual climb, followed by a faster ride down the Chemin de Pêcheurs next to the Serene river. The Combes track is a varied route that takes you through pastures and woodland, into the L’eau d’Olle Valley. It is not very technical and is made up of short descents and climbs. A reasonable level of fitness is needed for this 33km itinerary. Mountain biking not your thing? Check out our range of adventure holidays in France, and other unique adventures.